Rice is a special life force food for Japanese people and has strong ties with the origins of Japanese culture. Rice is the staple food of everyday, present in everything from the typical rice paddy scenery of Japan, ritual objects like shimenawa, and rice based food and drink like sake and Japanese sweets. 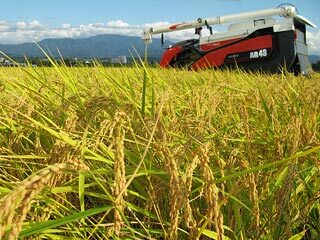 The way of rice cultivation suitable for the topography and climate in different regions of Japan has been developed and inherited locally. By eating delicious rice everyday the natural environment and people’s lives can coexist on a sustainable basis. Rice is a treasure trove of nutrition – an abundant source of protein, fat, vitamins, minerals and starch; rice is rich in the nutrients which are the fuel of human activity. It is said that rice starch has high quality nutritional value and promotes digestion. Bran ingredients contained in brown rice are packed with phytic acid, inositol, ferulic acid andγ-oryzanol. In addition, the amount of dietary fiber, vitamin B1, vitamin B6, vitamin E, iron, magnesium, manganese present in rice is substantial. In future years the presence of rice in our diets will become more and more an important choice as people who have concerns about the intake of gluten contained in wheat protein increases, and rice crop sustainability is excellent. The Kurobe River fan where the melting snow waters from the Tateyama mountain range flows is a great area for cultivating safe delicious rice. 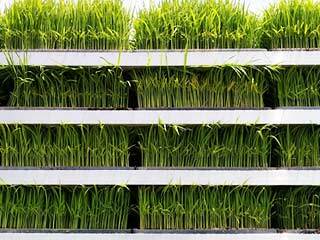 This KOSHIHIKARI rice is carefully cultivated with significant reduction of agrochemical usage. Soil amendment has been carried out utilizing composts of ripened rice hulls and cattle manure, and recycling processes in Kurobe basin agriculture is continuing to develop. Just harvested brown rice must be stored in the optimal state of freshness or it can degrade. Our suppliers keep newly harvested brown rice at a temperatures below 15°C prior to milling. Holding the pre-milled brown rice at low temperature ensures the milled white rice is delivered fresh at all times. 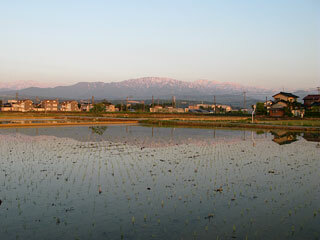 KOSHIHIKARI rice is cultivated carefully, as a result you taste more sweetness as you chew. It has a crystal clear aroma and matches any side dish. It is perfect for rice balls, or Japanese ‘onigiri‘, as the characteristic flavor and chewiness of KOSHIHIKARI will not be lost even after it cools down. As a specialty we also recommend SHIHOU, a black rice variety raised without using fungicides, insecticides or chemical fertilizers. It is a nutritious rice which derives its color from a purple black pigment called ‘anthocyanin’ in the husk of this rice. If you cook one teaspoon of the black SHIHOU rice into a cup of white rice it turns all the rice to a beautiful light purple color. 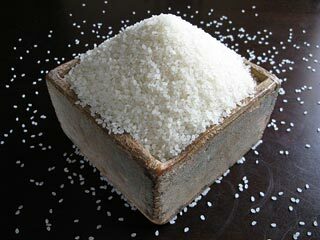 As with air and water, salt is essential, an indispensable substance for supporting human life. In some regions of the world, humans mine rock salt and lake salt deposits. In areas with high temperature and dry atmosphere, solar-drying salt production produces salt crystals directly from seawater through evaporation. In Japan sea salt production using the solar evaporation method is not productive due to the humid climate of most regions of the country. In Japan seawater is the raw material used in a fascinating process that has been actively practiced since pre-written history. Salt crystal is obtained by boiling seawater brine in enormous cooking vessels until the salt content is highly condensed, the water boils off leaving beautiful salt crystal. Maintaining a clean ocean is a very important theme for Japan. 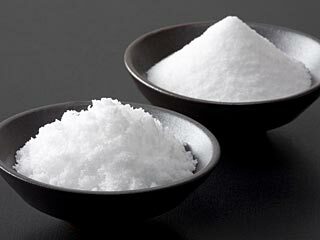 A salt is a mineral component that can not be synthesized in the body and plays a variety of roles for life support. About 70% of human body weight is moisture. One-third of this is extracellular body fluid such as blood and gastric fluids. Salt is dissolved at 0.9% in this extracellular body fluid. It is mysterious that the mineral balance of this extracellular body fluid and the mineral balance of seawater are very similar. Salt not only brings out the taste of ingredients as a seasoning, but it is indispensable in the preparation and preservation of foods. Salt also benefits the mouth feel or chewiness of food, encourages benign fermentation and improves the appearance of dishes. 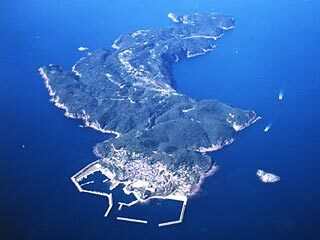 Kakarashima, located in the Genkai-nada Sea and is called a paradise for fish. 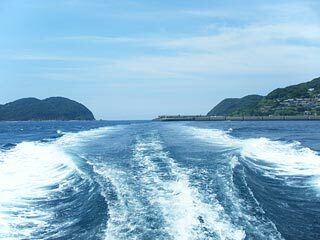 It’s the perfect place to pump up mineral-rich seawater from the Tsushima Current. This island was chosen because of the desire to use only the clean and highly-transparent seawater in the middle of the sea as a raw material for distilling salt. After thoroughly passing this clean seawater through a microfiltration membrane, it is slowly crystallized at a low temperature of 60°C. Calcium and magnesium are contained in excellent balance in pure white saltwater born salt. You can feel a subtle sweetness and a tenderness in the firm salty taste. Please enjoy the taste of the sea as you use sea salt to season your onigiri, or rice ball. For compatibility with rice onigiri, nori is also outstanding. The origin of the tea tree is in the mountain range extending from India to Yunnan Province in China. It is said that the origin of tea drinking is in China. The old Chinese book “Kouga” around the 3rd century notes a method of tea drinking. In Japan, it is said that the habit of tea drinking was brought in conjunction with Buddhism. In 1191, the founder of the Rinzai Zen sect, Zen Master Yosai, planted tea species brought from China to the mountainside of Higashi-Sefuri village in Saga prefecture. From Saga the love of tea drinking in Japan spread and was created into a unique culture, the ‘tea ceremony’ which was developed to fulfill mental training and refinement of social manners. From the Edo period, tea spread widely as a favorite beverage enjoyed by the common person everyday. As a characteristic nutritional component of tea, we introduce catechins and amino acids. 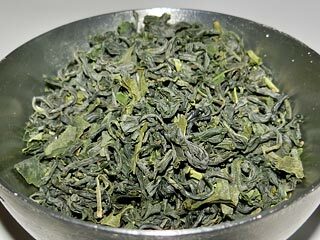 The main catechins included in tea are epicatechin, epicatechin gallate, epigallocatechin, epigallocatechin gallate, among which epigallocatechin gallate is the most abundant. Especially gallate type catechins have been scientifically confirmed to have the function of suppressing the absorption of fat and cholesterol. Among the Amino acids we should pay attention to L-theanine with the highest content, which functions such as stress relaxation, concentration improvement, relaxation action, improvement of sleep quality, etc. are reported. In the 19th century Nagasaki, a woman named Ohoura Kei was a trader who promoted Ureshino tea to the world and succeeded in dealing sixty tons of fine teas to England. 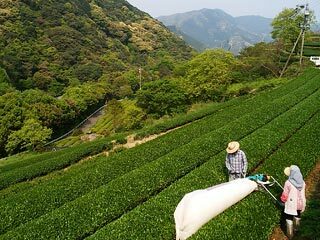 One of the best lands for tea cultivation is Ureshino. In the calm mountains of Ureshino, morning fog moistens tea leaves, the unique temperature difference between day and night gives Ureshino tea its rich taste. 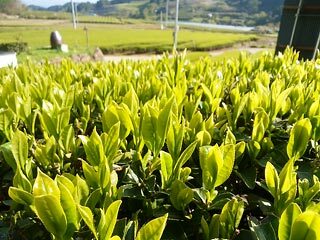 Tea cultivation is done without relying on agrochemicals. With skillful tea picking and tea tree cultivation techniques, a wide range of tea has been established by making full use of the tea farms in altitudes of 100 to 500 meters above sea level. Our tea growers span two generations in sustainable tea cultivation, includes soil preparation, weeding work, tea tree maintenance, tea picking and tea-processing. The effort of centuries of tea farming has produced Saga region teas in ten distinct, outstanding and delicious varieties. Utilizing the topography and climate of Ureshino to its fullest, the tea is cultivated carefully without relying on chemicals. It is a true fragrant healthy Japanese tea that you can enjoy every day. With a suitable brewing method, you can enjoy the robust scent of the roasted and rolled KAMAIRI-CHA. 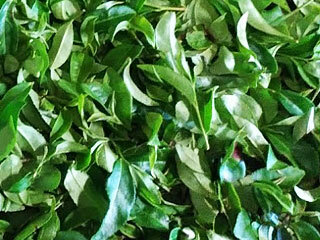 Or MUSHI-CHA, a green tea prepared with a steam and roll process which imparts a sweet deliciousness. Tea bag style COLD-BREW GREEN TEA has full sweetness and aroma and is recommended for quality tea drinking in convenience packaging. 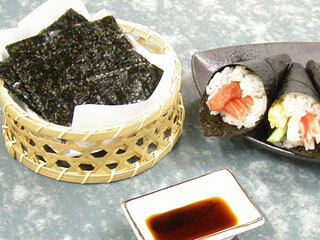 Nori is a traditional food special to Japan and is known in official tax documents dating back to the 8th century. It was prized as a gift by the upper class and as an ingredient in the vegetarian diet of temple life by monks. It was also called ‘fortune herb’ because it is easily affected by adverse growing conditions such as weather and water quality, the harvest quantities are not always stable. In 1949 a British seaweed expert and scholar discovered the mycelium of laver, the current technology of Japanese nori aquaculture was established with this knowledge. Nori is super food from Japan – the content of vitamin B12 is exceptionally higher than in other plant foods. 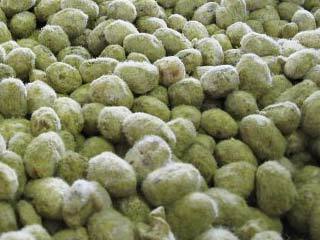 It also contains an abundance of beta carotene, folic acid, minerals and a water-soluble dietary fiber called porphyran. As Japanese food culture expands to the world market, it is expected that nori will contribute to the health of many people. 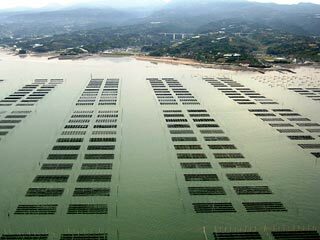 The Ariake Sea has fertile tidal flats known to be the best aquaculture areas for growing quality nori. The difference in tide level at low tide and high tide is the largest in Japan, 6 meters at the maximum tide, and at low tide the nori comes out from under the sea surface to be exposed in the full sunshine. The large freshwater rivers flowing into the Ariake Sea carry nutrient-rich water, earth and sand. 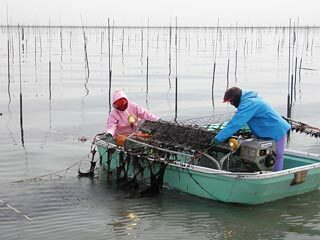 The fresh and saline water convergence in this part of the Ariake Sea create the perfect conditions of salt concentration to grow the softest and most delicious nori in Japan. The color is rich deep dark green, the thick Nori looks solid at first, but as soon as you put it in your mouth it dissolves quickly. Umami flavor and the incense of Ocean spread in your mouth. The deep green color is proof that carotenoids and chlorophyll are abundant, and the umami flavor is made by multiple amino acids. 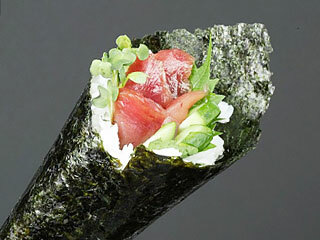 Nori grown in the calm Ariake Sea has a soft, thin cell wall, so the melt-in-the-mouth feeling becomes accentuated. It is fun to eat as it is, or eat Nori rolled around steamed rice, as wrapping on ‘onigiri‘ rice balls, and chopped to make toppings on salads, pasta and pizza. It is said that the origin of miso is from ‘jiàng’, a kind of salted soybean preserves from China. In Japan around the 8th century the middle of the fermentation process of soybean to become jiàng was recorded in old books. 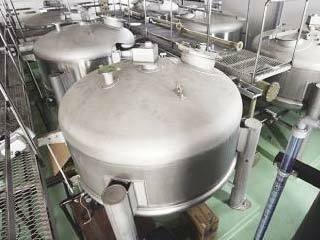 It is believed that this observation of the fermentation process is how miso was developed. Miso was originally a precious food valued by temples and aristocratic classes, it was rarely cooked as miso soup, and it was used as a side dish or medicine. Miso has been developed in various places in Japan with various characteristics made by regional methods ingredients, climate, eating habits and preferences. Even now types of miso are named for their location of origin, such as Echizen miso, Shinshu miso, Kaga miso, Sendai miso, Saikyo miso, etc. Miso is popular as ‘a taste of home region’ in cooking. 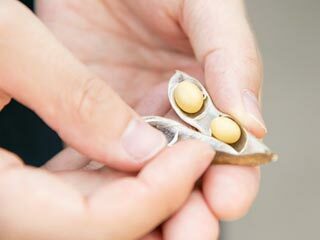 Soybean, the main ingredient of miso, is a food rich in high-quality protein, nick named ‘meat of the field’. In the fermentation process, large amounts of amino acids and vitamins are naturally produced by soybeans making miso a nutritiously excellent food. In addition, Koji rice mold, another main ingredient, delivers more than thirty kinds of enzymes such as amylase, protease, lipase, pectinase, etc. Miso being enzyme rich also helps digestion. Echizen City is known as an area of handicraft making and has a culture that takes care of every steps of work carefully. 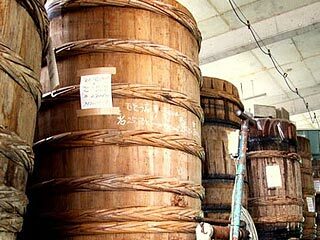 The unique Echizen miso brewing process has remained unchanged since the founding of the cities’ miso industry. The Eichizen philosophy of miso making is based on the idea that ‘Miso begins with the soil’. Following that philosophy, organic soy, natural Koji mold and clear well water collected from forty meters below ground are combined together in the wooden miso making vessels to undergo the miso fermentation process by using only high quality rice, soy and salt that has been practiced in Echizen for centuries. 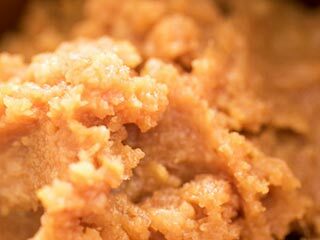 Miso producers consider details such as the soil of a particular farm and the quality of water to ensure safe and consistent miso quality as the result. These details, like the earth of farm and the scent of the soybeans help create variations in the balance of flavors in the miso – the richness, sweetness and purpose in cooking the miso can be chosen according to the customers taste.